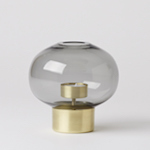 Quite possibly the most beautiful collection of bathroom accessories we’ve ever seen. Of course it’s by our friends at Nendo. The collection is for Bisazza who have already collaborated with design super stars like Jamie Hayon and Marcel Wanders. The series will debut at Milan this year along with an installation by Nendo. A wall-mounted box frame sink. An overflow bathroom sink and vanity. Mirrors that look like like pooling water in a wooden frame.